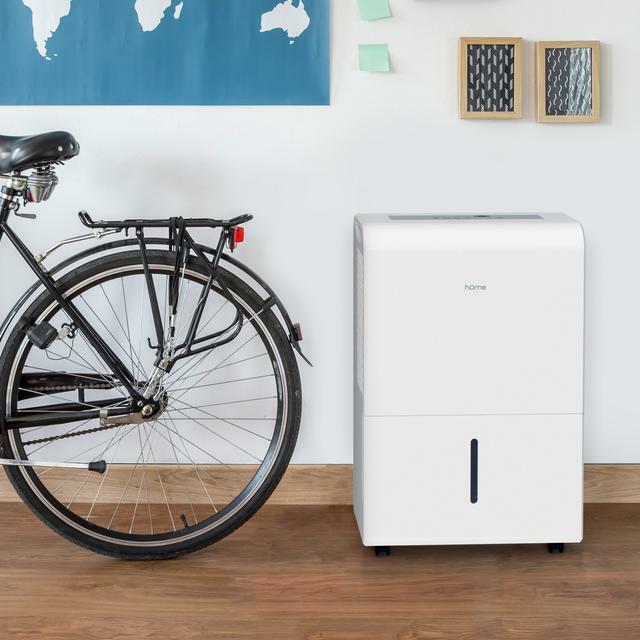 HomeLabs - 50 pint: Dehumidifier Review • The Air Geeks, reviews of air conditioners, dehumidifiers and air purifiers. If you live in small apartments or even some coastal areas you may have experienced high humidity levels that just won’t go away however much you try to leave doors open. This is because humid air sometimes gets trapped in the rooms especially kitchens and bathrooms and others where there is poor or non-existent ventilation. The best solution to this problem would be to look for a humidifier. In this article, we will have a look at hOmeLabs’ 50-pint dehumidifier and see how efficient it is in getting rid of moist air in the house at its price. Without much further ado, let’s jump straight into its features. One of the first striking features to notice about this dehumidifier is its elegant look and overall design. Most appliances out there are huge eyesores and we know that for a fact. But the design team really tried their best on this one to present a modern look that is clean and sleek. This enables you to place it anywhere in the house and it will still compliment your furniture. This dehumidifier even has built-in wheels to enable you to move it easily from one corner of your house to another. On top of this device, are carefully carved in handles that makes it very easy to handle. It is also very convenient to handle and operate as you only have to put it on and walk away to cater for your other businesses and you only have to come back after the water bottle is full and empty it. It will handle the rest on itself. From determining the correct rate of operation to going off when its water bottle is full, you won’t have to worry a thing. The noise level of hOmeLabs 50-pint dehumidifier is well on the acceptable levels for such a huge beast. While there would obviously be no dehumidifier in the market that doesn’t produce noise this one does a great job to make sure it is very minimal and only whisper quiet noise. The best thing you would compare it with would be a refrigerator. This means you get to watch your favorite shows undisturbed by loud fan noise. It could also help you sleep better if you want to place it in your room or kids’ bedroom. This appliance is capable of removing 50 pints of moisture per day through its 6-gallon per 24-hours capacity water tanks. This makes it ideal for large spaces of up to 2500 square feet. It works very well even in basement areas to remove the mold smells caused by trapped humidity in there. If you need a whole floor, a warehouse, or even a large office space covered, a single unit of this dehumidifiers will be enough to get the job done. You can place it in the living room and rest assured that your bedroom is also covered, especially if your house or apartment is middle sized. Another cool feature of this humidifier is its auto-shutoff feature. Without it, would mean that once the water tank is full, it will overflow to the floor and possibly damage it or the carpet. Auto-shutoff is also a security feature that can save lives by preventing overheating if the device is operating while being disassembled (it is possible, especially when curious kids play with it when you are not around). This can cause overheating and possibly motor-explosion. It also gives users an option to connect it to the house drainage network so that the water that is collected can join the drainage network. With this feature, you don’t have to enable the auto-shutoff feature as the appliance is safe can operate non-stop. On the pricing part, this dehumidifier costs about $200. This is understandable for the fact that is one of the highest rated devices on the market right now and, yeah, it’s fairly worth the high-end status in every right. Easy to Use This dehumidifier is hassle free when removing and emptying water tanks or changing its position. Can run Continuously If you have a busy daily routine, you can connect a hose power to your drainage system and it will run continuously. Small water-tank capacity Since the dehumidifier removes more water in a day than the tanks capacity, you may be forced to tend to it multiple times if you don't have a hose pipe. Working great (after only 3 weeks). If it's still OK after 2 Yrs., it will have outlasted my last 3 units (different brands). Quieter than others, but sound level doesn't change much between blower speeds. If it gathered an actual 70 pt./day, the bucket would need to be emptied 11 times every 2 days. Glad that I don't have that much moisture in my carpeted basement, where a direct drain is not available! Remember that rooms with 10 Ft. ceilings hold up to 30% more air (and water vapor) than those with regular height. Have I really found the best dehumidifier on the market?" I bought this after returning to my apartment after a week away- my place smelled musty and gross. I tried some hanging damprid contraptions and one did collect a lot of moisture but the chemicals killed me. I have Lyme and found I do much better in drier environments so figured this may be well worth the investment. The first day I let it run for an hour or two while I was home and was impressed at how much it collected. The noise is similar to maybe a running microwave and sounds like a white noise machine- I live in a city and thrive off white noise to block out urban noises. So far so good. My apartment feels fresher than it ever has. I will update my review if anything changes but so far I am very happy with the purchase. For the record, my apt is small maybe 700 sq feet and I bought the biggest version so I can run it even if I go away for a few days." 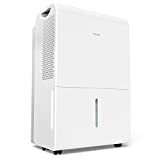 As you can see, hOmeLabs 50-pint dehumidifier is a great choice for those who are looking for a large area coverage and wouldn’t mind the cost. Also, for the fact that not many dehumidifiers out there get to receive such high ratings and recommendations as this one, we think it is worth every penny. Working dehumidifiers not only denies pest, dust mites, and allergens an environment to thrive in, but also helps to keep your respiratory system well ventilated while keeping you cough and sneeze-free. Now that you are well informed, the ball shifts on your side now to make the next step of purchasing the item or you can continue searching for our other dehumidifiers to see if any of them fits your needs and ideal price.